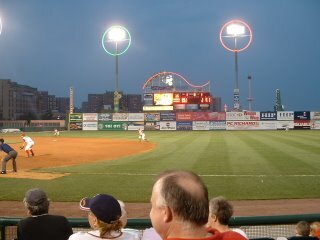 On Monday night I went to Coney Island, Brooklyn, New York City, Kings County, Long Island, New York State to Keyspan Park to see a Brooklyn Cyclones game. 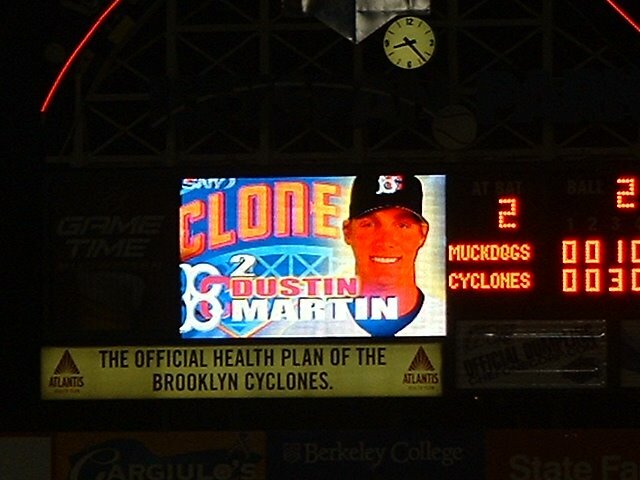 The 'clones are an A-ball affiliate of the Mets. Click these pics to enlarge. 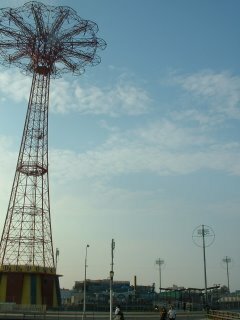 Here's the old Parachute Jump. My mom went on this when she was little. Kids used to get strapped onto a chute attached to a long cable, get taken to the top and then dropped as the chute opened. Needless to say, they don't do that anymore. 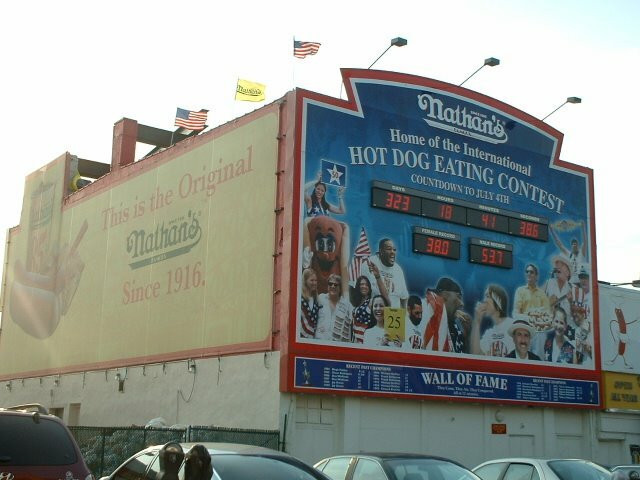 But the thing still stands. To the right of it you can see the lights of the recently built Keyspan Park. 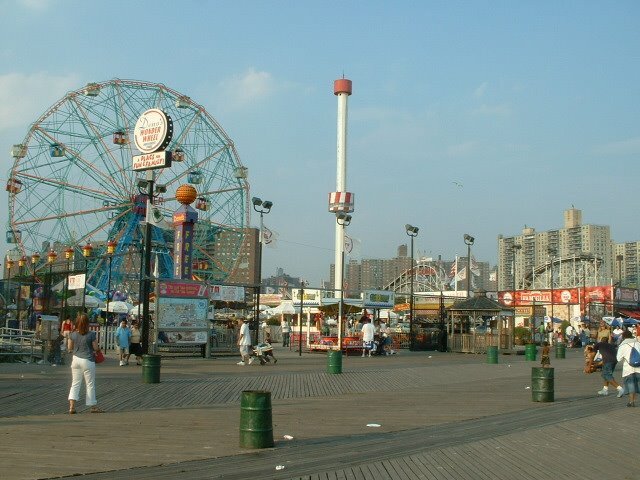 The ocean is to the left of the boardwalk. Here's Nathan's. As I rounded the corner, I'd see Chan, waiting for me. And there he is. I totally snapped this shot before he knew I was there. I love the shot. First of all, Chan, you actually stand and read the paper while waiting for me? What is this, the thirties? Second of all, candid shots are always cool. Third of all, vertical pics with vertical signs are cool, too. This is taken from out on a pier. 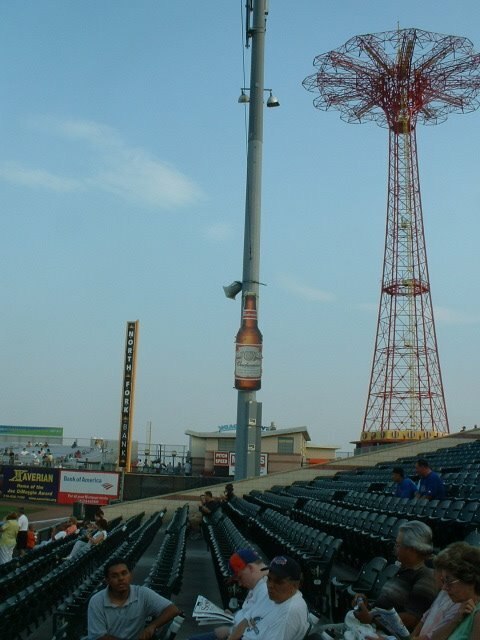 The Parachute Jump and the ballpark. 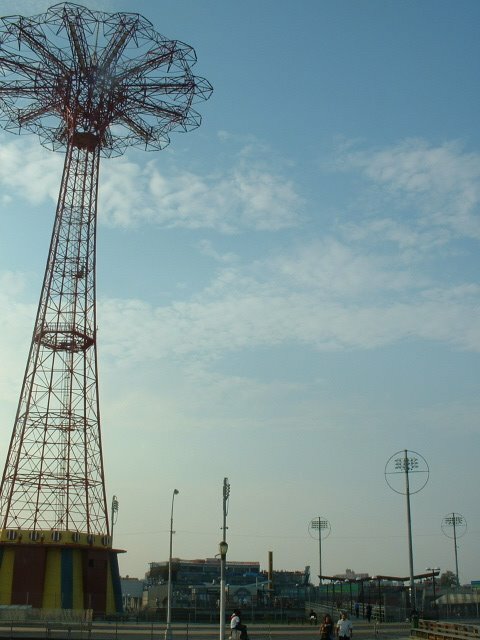 Note: Coney Island is neither cone-shaped nor an island. Discuss. View of the PJ from our seats. All the aisle seats looked like this. In A-ball, the cameraman and interviewer are the same dude. Some Cyclones. 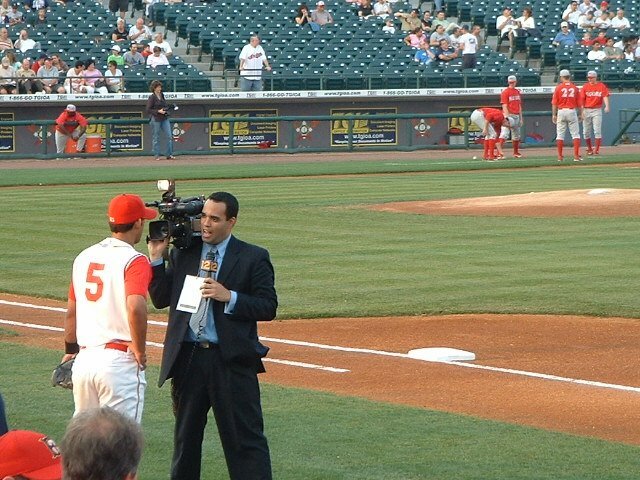 At left, and being interviewed above, is Luis Rivera. There's nothing I can find that says he's the son of the former Sox infielder of the same name. So, I'll just believe it is his son, and he will be my favorite Cyclone, until I hear official word otherwise. I like ballparks near bodies of water, and this one is no exception. 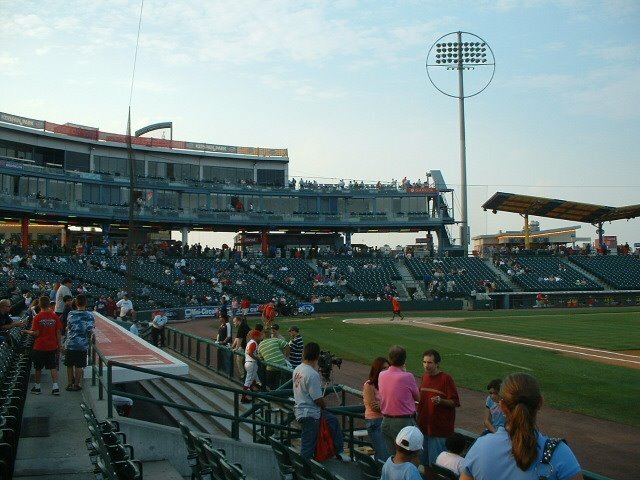 The ocean is out past right field. 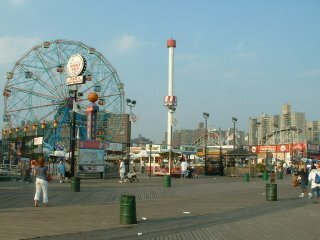 However, the way Coney Island is situated, you can't see the water unless you go right up to the boardwalk. So, even from this perspective, you can only barely see it. Just a lot of sky. 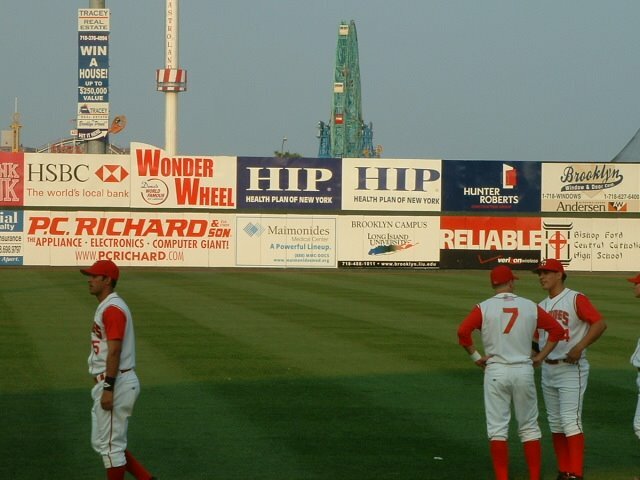 The amusement park rides over left field prove to be the better backdrop, especially at night. 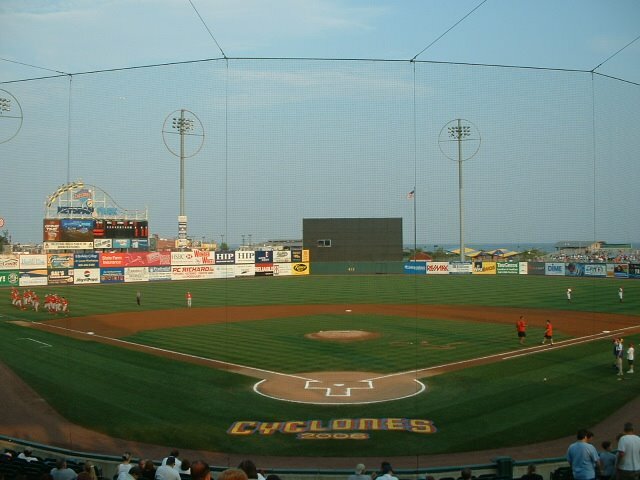 The fake Cyclone. 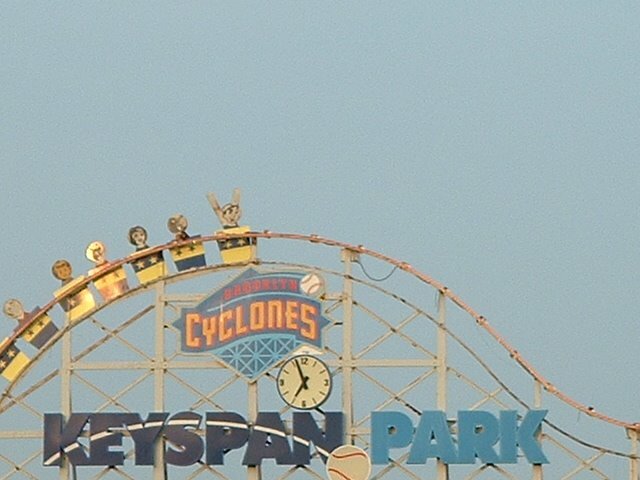 I gather these folks go for a little ride when a Cyclone hits a dinger, but none of them did. Another action shot. Where "action"="inaction." 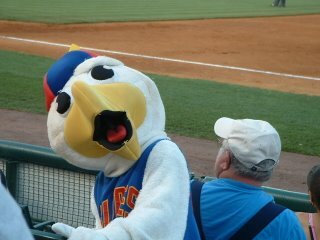 One of the Cyclones' mascots. No, he's not surprised. His (her?) mouth always looks like this. 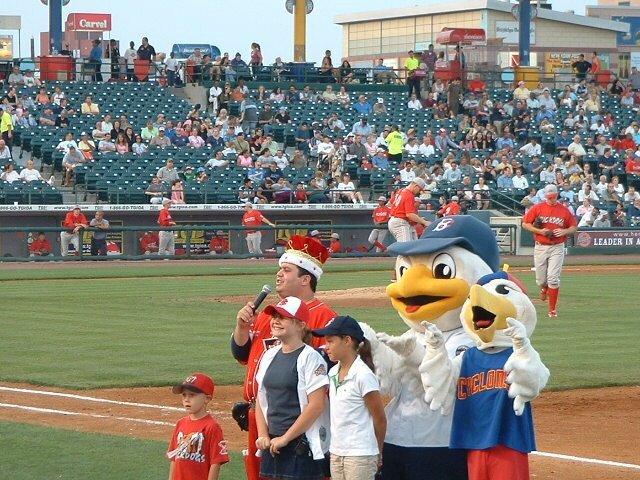 The two mascots, along with the very "Capturing the Friedmans-ish" King Henry. Night falls on this dude's bald spot. 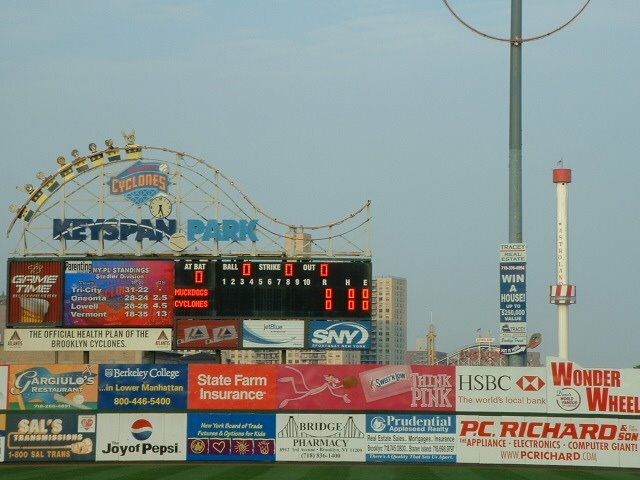 In the background, left to right, you can see the Cyclone (barely. 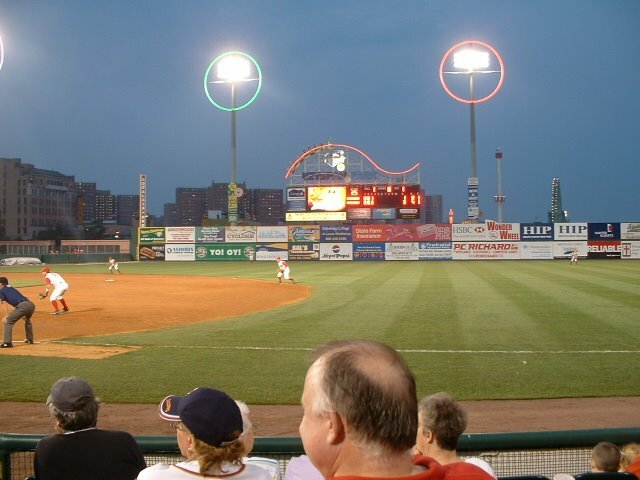 Again, look right above HSBC, you'll see "CYC" lit up), the tall thing with what looks like a KFC bucket that goes up and down, and the Wonder Wheel (green, far right). No, I didn't go on any rides. The F train teetering two stories above Brooklyn is enough of a thrill-ride for me. Chan pointed out that the way the Cyclones name appears behind each player, it looks like "Clone." I then realized their pictures make them look like actual clones. (If clones were red.) So, here's the clone of 'Clone Dustin Martin. 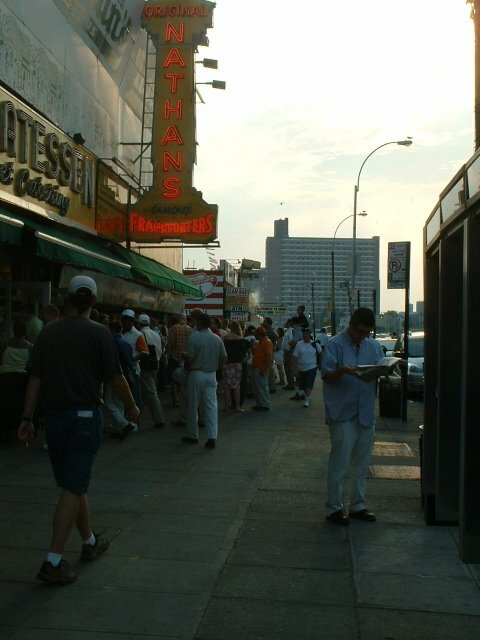 I like how in this shot, a guy orders two of something. This dude looks like Clark Kent when he ran home from school to beat the car full of popular kids who were on their way to Mary Ellen's to listen to some records. 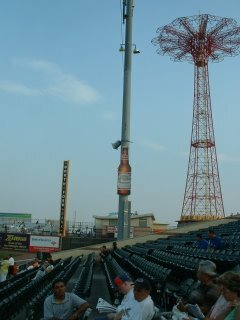 Looking up at the Parachute Jump on our way out of the ballpark. Would you believe me if I told you they do "Sweet Caroline," complete with fan sing along with the "so good"s and everything? They do. I swear. I turned around and looked at everyone in disbelief. I found myself yelling to Chan, "Look, the Yankee fan's doin' it, the Yankee fan's doin' it!" So bad. 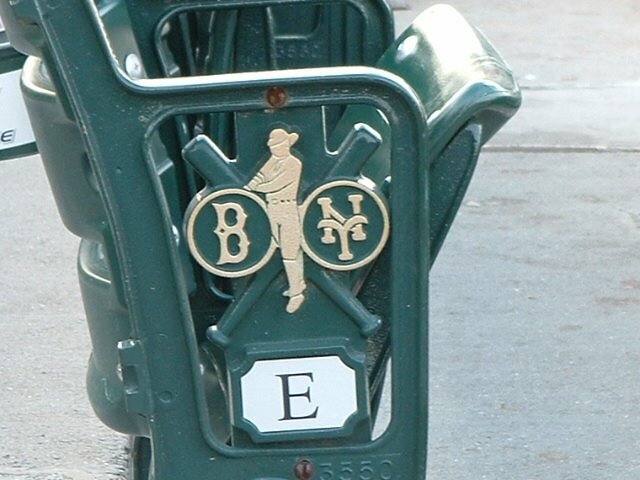 As bad as the "No Sleep Til Brooklyn" parody, called "Baseball In Brooklyn"? No. 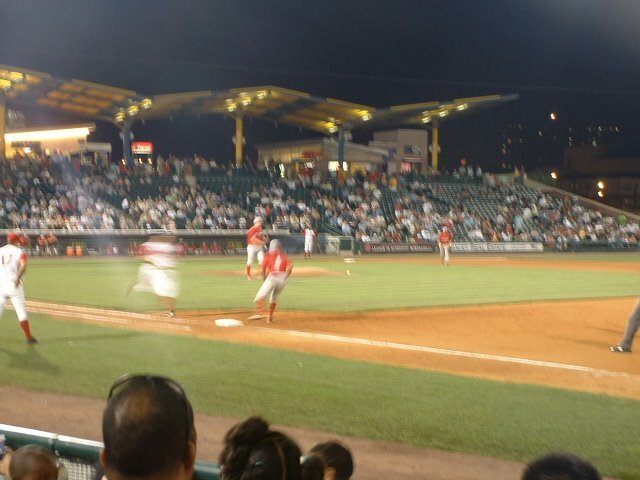 Along with that stuff, there were the usual minor league game features. 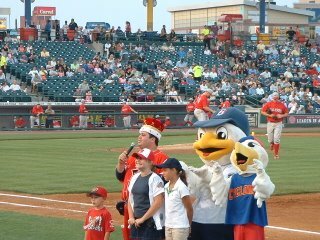 Announcer dude, hot dog races, contests, T-shirt tosses, kids all over the field. 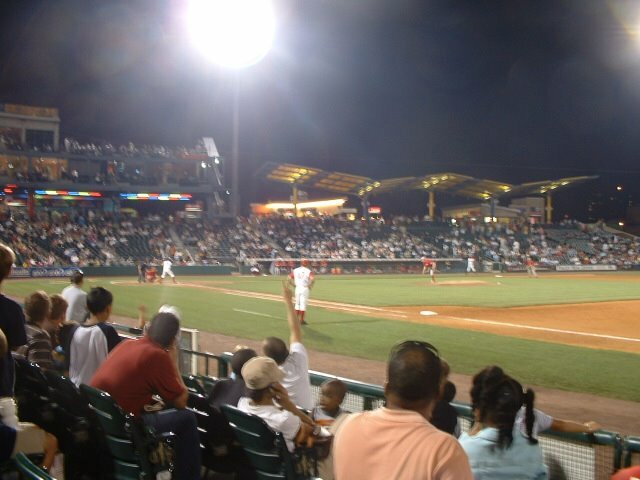 But a good place to watch a game, and a fun experience. 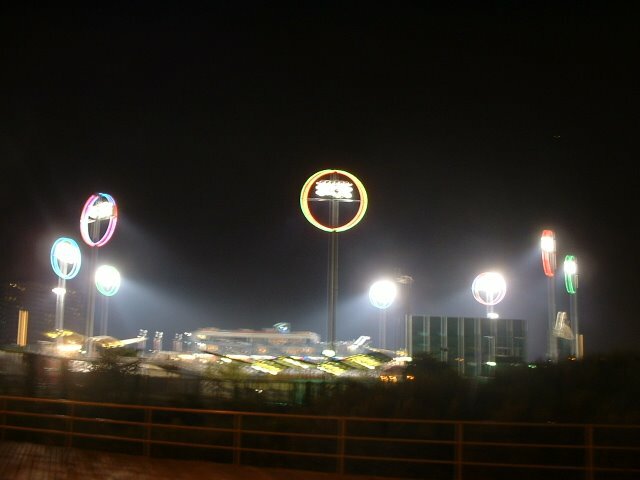 The park as seen from the boardwalk at night. Another guy in a Red Sox hat is just off screen, as he happened to be walking by. 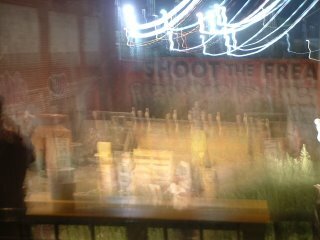 Finally, a blurry, hence cool, shot of "Shoot the Freak." You pay money to shoot paintballs at a live person. The hokiest of the Coney Island hokey. 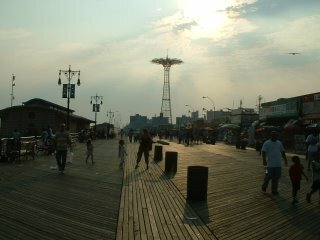 I'd been to Coney Island twice before. 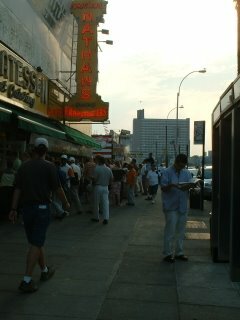 Memorial Day 2003, when it was about 30 degrees and rainy. 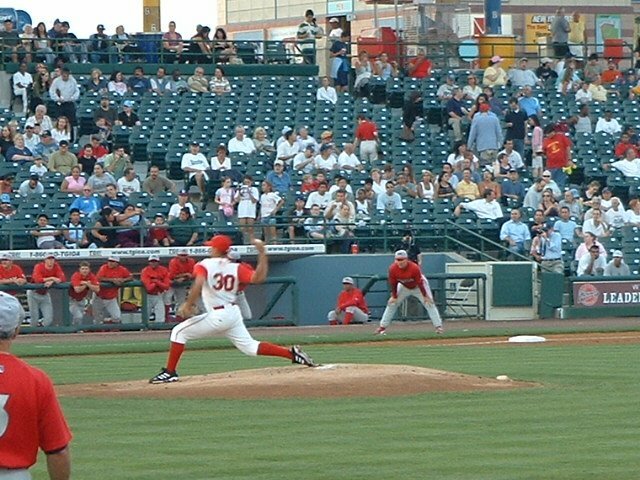 (If you remember how bad it was that weekend when Wakefield beat Clemens as he went for win 300, a game I was at, well, it was like that at Coney.) And last summer, but only for a little bit, just to go out on the beach for a while. No, it wasn't summer. The point is, there was no one there. And I've been to other parts of Brooklyn before, but only the "hip" parts. There I experience hipsters, who you can see anywhere. (Although the hippest--read "pukebarf"--of the hip are in Brooklyn.) The point is, I guess this was my first time fully being ensconsed in classic, Welcome Back, Kotter-style Brooklyn. And I have to tell you, I felt like an alien. I honestly thought that if I tried to talk to another fan, they wouldn't know what I was saying, because it would just be mumbo-jumbo to them. Now I know why Brooklynites think of themselves as their own city, and want to be separate from Manhattan. The two are just nothing alike. 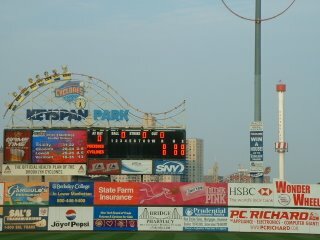 I'm not putting them down, I'm just saying, I finally got to witness the huge difference between the two boroughs. Maybe someday one of us humans will set foot on Staten Island, and we can find out what those people are like. 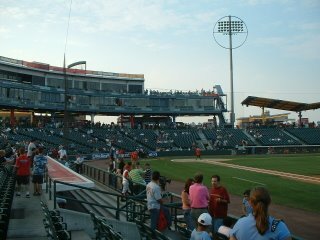 Speaking of that, at one point during the game, they announced an upcoming game with the Staten Island Yankees, and I immediately booed, and everyone else joined me. That's where me and Brooklyn are one and the same. & Brooklyn was its' own city until 1/1/1898. I love those pics. And I always hear the song TUNNEL OF LOVE by Bruce in the background. It's a dark ride. Love. And life. But not always. Nice shot of the side of the seats with the Brooklyn Dodgers and Mets emblems - I'm cheap and have only ever sat in bleachers, so I've never seen those. 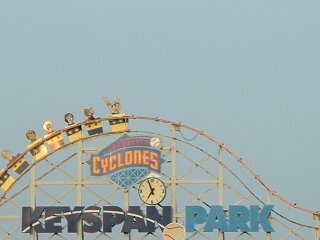 The folks on the mini-Cyclone are affixed, sadly. I was very disappointed when I saw Mike Jacobs clout one last year and they did nothing. Been away, so catchin' up on Letsgosox. Boy, did those pictures bring back memories. I went on the parachute with my cousin Paul (who Grandpa called, "Paulie-Putty.") We sat on a two-foot long plank about six inches wide and an inch thick. Some guy strapped a belt across our laps and told us to sit up straight and hang on. There was no back to it, so if two eight-year-olds tipped back, they'd probably slip out of the belt. The cable took you up so slowly that I thought we'd never stop. 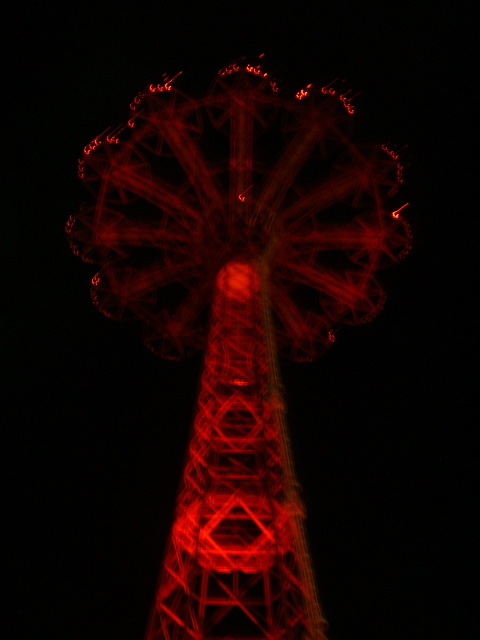 Then when I was sure we'd never stop there was this loud click and we went into free fall until the parachute filled with air. Jesus, Mary and Joseph. Once we'd survived, Grandpa wasn't there. When we found him, he said he'd been watching a hootchi-kootchi girl (his term)and lost track of the time. Paul and I wanted to see the hootchi-kootchi girl too, but he wouldn't let us.